Pablo Lorenzo-Eiroa is an Associate Professor Adjunct at the School of Architecture of The Cooper Union, where he is the head professor and coordinator of the Master Program Advanced Design Studio (M.Arch II fall semester). He teaches digital representation for both the undergraduate and graduate programs and is the Director of a Digital Representation and Fabrication Program (CE). In previous years, he was the head professor and coordinator of Design II (fall semester). In addition, Prof. Lorenzo-Eiroa has been an invited professor at UPenn, Columbia University GSAPP (roving critic), Sapienza University (Rome), Universitat Internacional de Catalunya (Biodigital Master Program, Barcelona), Universidad Torcuato Di Tella (Lab 003) and the University of Buenos Aires, among other institutions, where he was also invited to lecture. He also lectured at Princeton University, ENSAS Ecole Nationale Supérieure d'Architecture de Strasbourg, the Architectural Association (workshop), the US Embassy in Buenos Aires, ACADIA 2010 and 2009 at the Art Institute of Chicago, among others. Lorenzo-Eiroa has received research grants and awards from the Fulbright Program (2001), National Endowment for the Arts (2002), Butler Prize and EC-US at Princeton University (2004), among others. He authored/edited several books, including: Instalaciones: Sobre el trabajo de Peter Eisenman, DLO/RE, Buenos Aires 2008; developed relational computer based graphics for the book Solsona: Justo Solsona: Entrevistas, Infinito, Buenos Aires 1998; published a manual entitled Analog and Digital Strategies Between Interfaces, 2006; co-edited Life in Formation after co-chairing the ACADIA 2010 conference at The Cooper Union and Pratt Institute; and recently co-edited Architecture In Formation, Routledge, London 2013 after a peer review process. After studying in the undergraduate (Diploma Architect) and graduate schools (MAAD) in the University of Buenos Aires, he completed a post-graduate seminar at the Superior School of Fine Arts Ernesto de la Carcova and later completed his M.Arch II at Princeton University under a full scholarship. Lorenzo-Eiroa collaborated directly with Peter Eisenman as a senior lead designer and project architect on a number of projects, including three built installations in Europe, the completed Arizona Cardinals Stadium and the Second Prize for the Napoli TAV terminal design competition. He was also lead designer for the team Meier- Eisenman- Gwathmey- Holl, finalist for the World Trade Center competition organized by the LMDC. 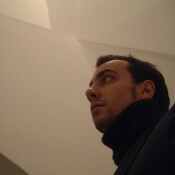 Lorenzo-Eiroa is the Design Principal of e-Architects | eiroa Architects. Through e-Architects, he is integrating theoretical speculation and disciplinary expertise in different associations, with work ranging from academic research, to scholarships and publications, to architectural design via private and state commissions in New York City and Buenos Aires. Working with continuous and discontinuous signs of information, through different media-based interfaces, his research focuses on questioning assumed cultural structures. His work focuses on recognizing and displacing stable spatial organizations through topological transformations to overcome predetermination. Implementing these strategies, his designs aim to critique the apparent opposition between conceptual relationships and physical and mediated affection. e-Architects' projects have been presented and published in a variety of media. Its mixed-use building proposal for the World Trade Center was part of the Thinking Big initiative by the New York Times which included Eisenman, Koolhaas, Hadid, Meier among others. Other professional projects, academic research and articles have been published in Clarin Arq, La Nacion Arquitectura, Revista PLOT, Yale Constructs, Plataforma Arquitectura, Suckerpunch, Pidgin, Archinect, Architizer, AIA-Connection, Paradigms in Computing, Performalism, Imagining Ground Zero, Pulsation, and Biodigital Architecture. The studio's projects have been exhibited at the Venice Biennale, The Instituto Cervantes, Disseny Hub, Pabellon D'Arsenal, MoMA NY, NYC Media Lab, Bugaik International Architecture Exhibition and Universidad Di Tella, among others. e-Architects' practice Manifesto was part of FreshLatino at The Storefront for Art and Architecture. The studio was pre-selected for an international redevelopment competition for Osaka's Umeda District in Japan, and its projects were also presented at PechaKucha New York #11 as part of a series of events for the Festival of Ideas for the New City curated by the New Museum in New York City. View Pablo Lorenzo-Eiroa's CV here. DLO/Robles Ediciones, Buenos Aires 2008. 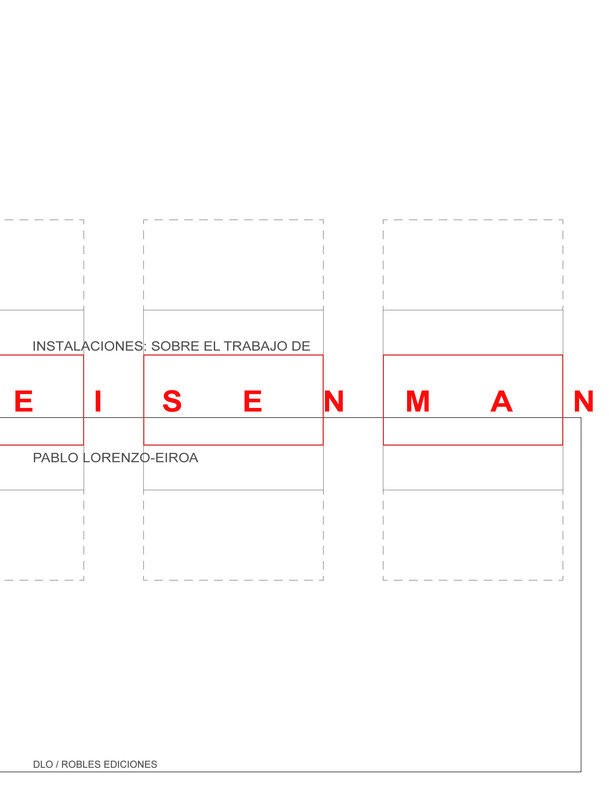 For the first time in Spanish, this comprehensive book develops rigorously all of architect and academic Peter Eisenman’s built architecture installations. Instalaciones was authored and edited by the Argentinean architect Pablo Lorenzo-Eiroa, a professor at the Cooper Union School of Architecture in New York City, after collaborating in Eisenman’s studio for several years and designing three of the installations included in this publication. This book is simultaneously a text book and an image book. Its relevance is derived from the fact that it presents important actualizations and unknown aspects of the radical theoretical thinking of Peter Eisenman, who previously collaborated with the French philosopher Jacques Derrida, as he is one of the only architects to have developed a full critical deconstruction of the language of the discipline. Supervised by Eisenman, this book includes previously unpublished material: a synthetic collection of texts of Eisenman’s career, a text by professor Guido Zuliani and many texts by Pablo Lorenzo-Eiroa. These texts deal both with histories and theory of architecture and its current relevance, but also critique the current state of expansion of the discipline, developing concepts such as index, diagram, writing, form, folding and spatial warping, but also affect as resistance to the visual and metaphysics of presence. These issues have been dominating the avant-gardes of the last forty years, established new canons and have positioned the work of Eisenman as a main theoretical reference. 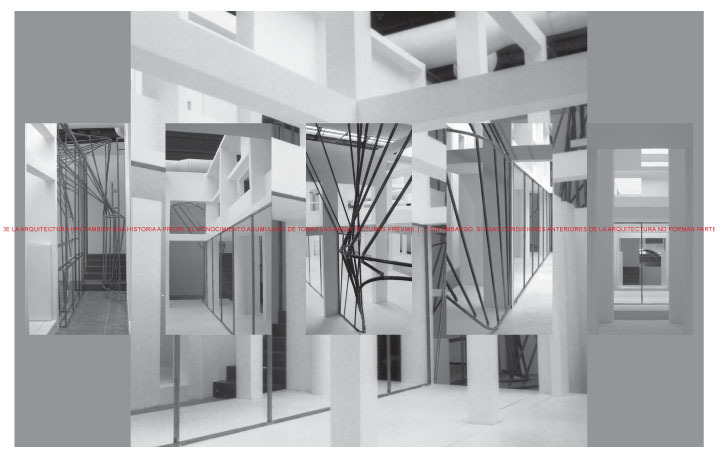 In opposition to artistic installations, the installations are presented as pure architectural exercises; such is the case, that the book itself critically presents the installations’ spatial ideas parallel to the spatial deep structure of this medium. This conference also involved a satellite exhibition at Pratt Institute of work curated by the Exhibiton Chairs of ACADIA 2010: Chandler Ahrens of Morphosis, Axel Schmitzberger Assistant Professor at California State Polytechnic University, Pomona and Michael Wen Sen Su Visiting Assistant Professor at Pratt Institute. It seemed appropriate to question these problems to a school where the deep understanding of representation has activated different levels of self referential disciplinary thinking that propelled different structuralist and poststructuralist approaches. Such strategies enable a responsive generative capacity in interfaces where architectural problems are activated by the questioning of the frame through which they are constituted. Architecture is then possible at that moment, when the interface performs within the work, establishing an autonomy, a reality, and a metaphysics only possible within the discipline. An autonomy that has not yet entered the digital…. These premises were integrated through the curatorial work of the conference chairs, but were also challenged and expanded by the work and discussion of the many participants of such a complex international event. 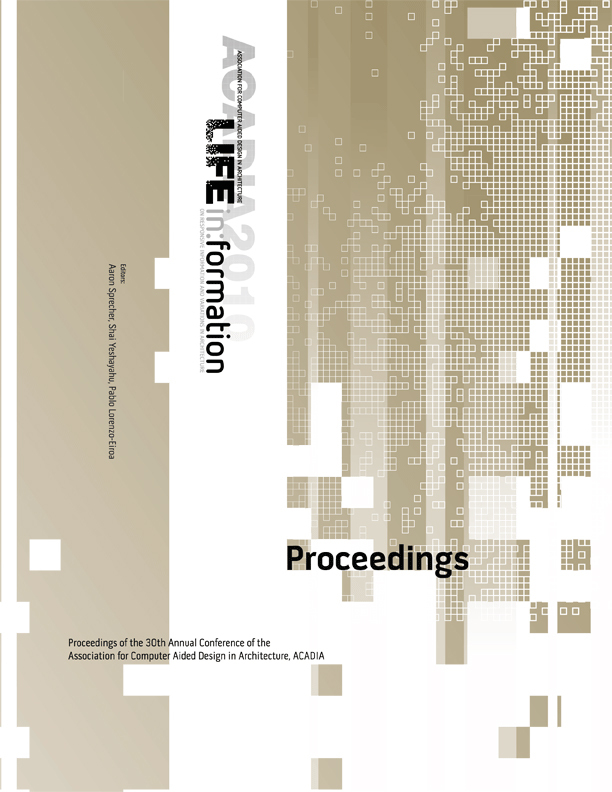 In order to draw certain interest towards to the immense body of work left in the publications, it is interesting to note certain themes that were able to grant certain strategies and attention against the linear use of information. The keynote lecturers included both theoreticians, historians and experimental practitioners, such as: Georges Teyssot derived from a foucaultian background the problem of curvature through a philosophical approach, critiquing linear information representation relative to the topological relationship intrinsic in Sausure’s algorithm Sign=S/s; Antoine Picon provided a critical historical reference to the digital project pointing the work of experimental practitioners; Karl Chu built up a genetic based morphogenesis based on cross relationships between the brain and organisms in an architecture autonomy implicit to computation in his Planet Automata series; Evan Douglis constructed morphing patterns that incorporate evolutionary movement; and Georges Legendre introduced a mathematical specificity from binary codes that layer information. 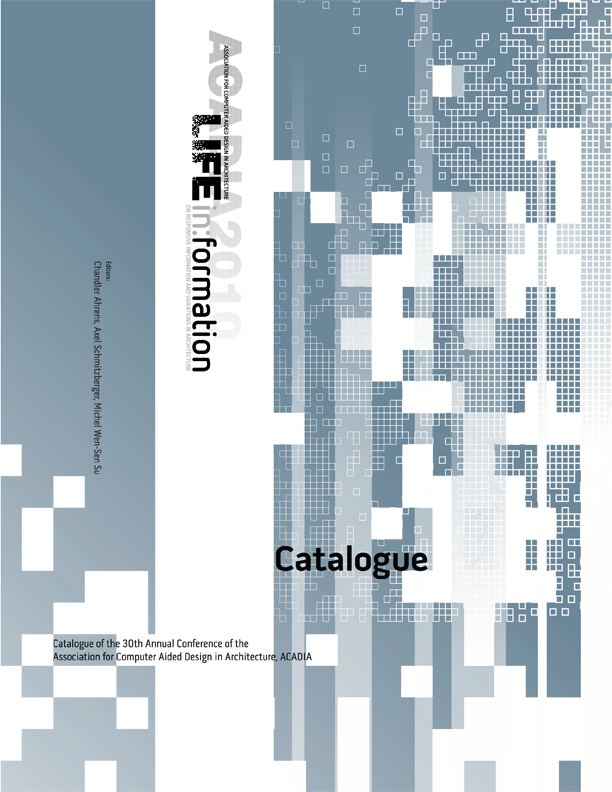 ACADIA 2010 Conference Proceedings and Catalog publication includes critical essays and projects. Featuring essays by: Pablo Lorenzo-Eiroa, Aaron Sprecher, Georges Teyssot, Mario Carpo, Patrik Schumacher, Bernard Cache, Mark Linder, David Theodore, Evan Douglis, Ingeborg Rocker and Christian Lange, Antoine Picon, Michael Wen-Sen Su, Chris Perry, Alexis Meier, Achim Menges and Martin Bressani. Projects by: Diller Scofidio + Renfro; Mark Burry; Yehuda Kalay; Omar Khan; Jason Kelly Johnson, Future Cities Lab; Alejandro Zaera-Polo and Maider Llaguno Munitxa; Anna Dyson / Bess Krietemeyer, Peter Stark, Center for Architecture, Science and Ecology (CASE); Philippe Rahm; Lydia Kallipoliti and Alexandros Tsamis; Neeraj Bhatia, Infranet Lab; Jenny Sabin, Lab Studio; Luc Courschene, Society for Arts and Technology (SAT); Eisenman Architects; Preston Scott Cohen; Eiroa Architects; Michael Hansmeyer; Open Source Architecture; Andrew Saunders; Nader Tehrani, Office dA; Satoru Sugihara, ATLV and Thom Mayne, Morphosis; Reiser + Umemoto; Roland Snooks, Kokkugia; Philip Beesley; Matias del Campo and Sandra Manninger SPAN; Michael Young; Eric Goldemberg, Monad Studio; Francois Roche; Ruy Klein; Chandler Ahrens and John Carpenter. Pablo Lorenzo-Eiroa is an associate professor adjunct at The School of Architecture of The Cooper Union. Aaron Sprecher is an assistant professor at McGill University School of Architecture. Systems and singularities, possible systemic singularities: Cartesian systems and the topo-logos. Parametric negative-dialectic information exchange between a natural pseudo-Cartesian rock formation and an artificial topo-logos. This project is situated within a larger system of natural geographic accidents where the typological sequence Bay-Bar-Peninsula-Cape-Lagoon-River is repeated with topological differentiations. This project articulates a landscape-sensitive proposal to develop housing with care to natural formations and dynamic processes. This initiative goes further into ecological concerns, redefining the concept of “nature” to begin with. Nature is an artificial category identifying the first contradiction in current green initiatives that aim at most for natural preservationism. This initiative focus on a deeper understanding of what might be the meaning to develop an ecological approach within artificial interventions. An artificial ecology that is sensitive to the logic of the environment within which is situated. The project develops a variety of low to large scale building units, ranging from independent isolated house units. Through various intermediate scales open up deviations within types, and reach larger scales of intervention, constituting medium density building types. This strategy critiques large tabula rassa type of modern interventions that are not sensible to the logic of the place. By these means, the project intends to develop a series of intermediate discrete types articulating bottom up and top down modus-operandi, alternating tactics based on the latency of opportunities for discrete categorization based on a topo-logos, and aiming for the constitution of indexed larger architectural structures that incorporate organizational strategies as well as systemic logics. Cartesian strategies and top down systems are constituted by mirroring existing rock formations. But this mirroring of nature is purposely put against a Hegelian mirroring of Nature. A negative dialectic becomes active when the existing rock formations are considered articulate cuasi-Cartesian rational orders. These rocks formations conform large linear strata of rocks that develop perfect straight lines, differentiating these accidents from mere natural formless rocks and opening up other larger humanistic questions. Due to such interesting faults in the rock this potential latency opens up a different consciousness about the known relationship between nature-artifice. With this basis, the project develops a Cartesian order that is grounded in a topo-logos sensibility. This sensibility works with an accidental formal logic that is based on the formal language that these rock formations develop, but implementing a humanist artificial philosophy. This logo-centric philosophy is then sensitive to the logic of the place, since tactical movements are related to formal structures that arise through abstract metaphysical categories. Eiroa Architects was invited by Kengo Kuma and Yusuke Obuchi to an International Competition for the Umeda area in Osaka, Japan. Eiroa Architects was pre-selected through a portfolio competition together with 20 international offices - only 5 from the USA / others local teams from Japan - to submit a proposal for urban redevelopment. Even though EA did not make it to the final selection (RUR, Dominique Perrault, UN Studio, Fuksas, and others) was honored to be part of such selective group of international experts. The final competition selection results were released as of 2014-03-27. A grounded ground is an artificial ground. A green artificial topography. A grounded building weaving through a grounded ground becomes a ground-scraper. A topological groundscraper-building. It is not ground nor it is a building. It is not not ground, nor it is not not building. A park with buildings. A park and not building. A park not building. A park as a building-park and a building as a park. A park and an underground building. A not building-park. A street and a park. A street and a building. A street building becoming a park. A park-building with grounded-buildings. A park-building with topographical buildings. A park-building with grounded buildings. Grounded buildings that emerge from a building-park. Grounded buildings that emerge from a double grounded ground. A double ground weaving sequence: A ground surface and a building surface. An undulating ground surface and an undulated building surface. A park building surface weaving upon itself. A double park building surface. A park building double surface that becomes a grounded building. A grounded building surface that becomes a de-grounded building. A tall building that emancipates itself from the ground surface. An elegant non-grounded ground-like building. A non grounded ground skyscraper. The landscape interventions proposes a parametric topography displacing the natural grade reference level of the city of Osaka in Japan. The ground level is thickened and made inhabitable, providing different opportunities for diverse activities. The thickened parametric surface proposes topological continuous undulating spaces for public use. Private buildings that allocate diverse urban functions emerge out of the displacement and splitting of the ground surface. We have surpassed the point of irreparable damage to our planet. At this point, several scientists confirm that ecological balance may only be achieved by artificial means. Ecoinduction II proposes a mega-structural territorial scale and envisions a radical modus-operandi to striate the entire territory of the Jamaica Bay, connecting the expansion for JFK airport in the metropolitan area of New York City by structuring the natural growth of the bay wetlands eroding system. A field of inflatable buoys initiates a machinic responsive process affecting the environmental balance of the water bay promoting side effects that alter the dynamic stability of this natural ecosystem. These elements are implemented initially to slow down the water flow, promoting latent banks inducing sedimentation, boosting multiple diverse ecological environments and developing multiple programmatic opportunities in different landscape scales. Once they activate the sedimentation process, they become progressively fixed and then are disposed. This intervention affects environmental dynamic forces, structured positively, using such instability to induce latent landscape opportunities, in an artificial ecology of natural feedback exchanging information and energy. © Pablo Lorenzo-Eiroa, Eiroa Architects 2011. Topological surface-space parameterized against its referential dynamic Cartesian space. Static Cartesian frame + topological möbius strip surface indexing spatial warping = integrated in a synthetic composition. Andrea Pallasio's Palazzo Chiericati, diagram. Wittkower’s eleven Palladio schemes (Wittkower R. 1949) develop only a differential change of degree and not such conceptual typological change. 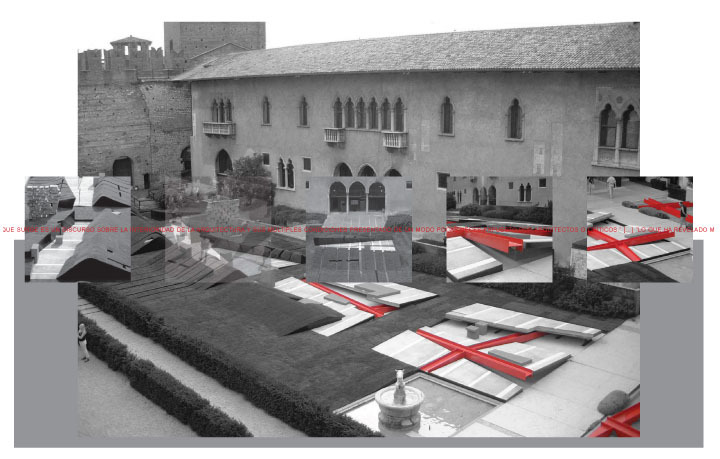 Based on an projective architectural analysis of Carlo Rainaldi’s Santa Maria In Campitelli, this essay reveals how topological displacements may critique a departing type in a synthetic solution between opposites, promoting tension through spatial pulsation, polyrhythm and other spatial bodily affections. The aim is to develop a draft for a manifesto to critically suspend the continuous state of pendulum revolution in architecture history, between the establishment of a canon and its reactionary dialect, identified by Wölfflin’s Renaissance and Baroque categories, by proposing a non-dialectical a-historical synthesis that is able to attack a long lasting metaphysical project. On the other side, this essay questions the unrecognized striation of digital interfaces infer in the constitution of form in topological displacements, topological surfaces and how they transform the referential stability of absolutes. Thus relate the topological surface-space of the object to the Cartesian frame-space of the medium of representation, proposing the recognition and institution of a contemporary state of suspension that demands an hybrid transitory space between a modern Cartesian space and a potential topological space, that this essay proposes to define as cartopological space. House II develops three topological displacements that affect the stability of each of its three referential Cartesian coordinate planes. These displacements layer information parametrically, combining different source codes through multiple interfaces. Relative displacements are targeted to activate emerging typological instances to overcome the original organizational structure. Beginning with three centralized nine square grid volumes, the center of one volume is displaced by becoming continuous with the corner of the other - a relationship repeated in the three axes. The relative relationship between the three axes is also displaced, activating multiple typologies within a unifying continuous topology. Therefore House II resolves multiple typologies that are first activated and then critiqued through topological displacements. Synthetic complex continuities between centralized courtyards become internalized through the corners; exterior bridge-spaces become internalized; and finally, a twofold L shape space integrates a horizontal XY house, a vertical YZ house and vertical XY house in a continuous topology. All of these typologies are integrated into a continuous synthesis that displaces their initial set of categories. The displacement of center-corner and interior-exterior relationships through topology is also taken to another level, since the surfaces that actualize these continuities are also delayered. An internalized topo-logos activates a bodily affection by displacing the deterministic binary-based planar condition of the surface into a differentiated field of interstitial spatial delimitations. Architecture has been expanding towards the landscape. 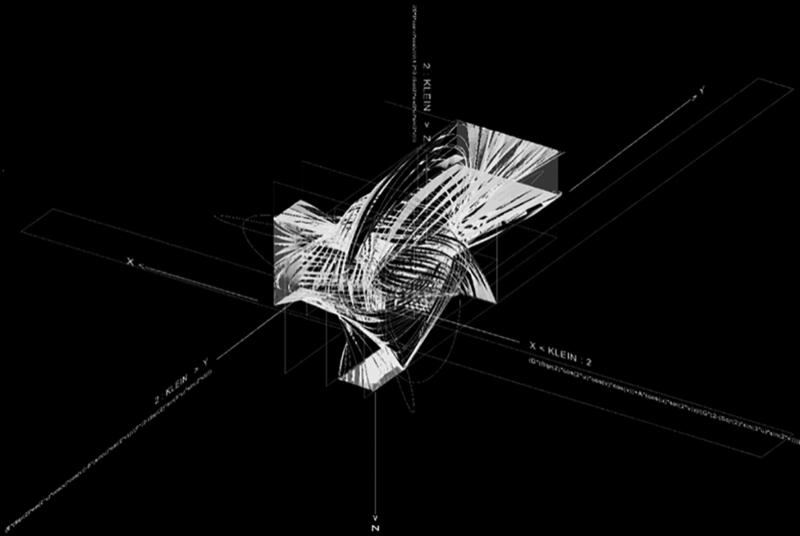 By enfolding this process to displace the architectural container, House II develops an internalized topo-logos that reveals non-deterministic relationships, displacing the original referential Cartesian container space through multiple operations. "The Museum of Looping (topological) Paths"
multidimensional space, as opposed to a space limited by two dimensions (plan / section). This cognitive spatial relationship informs the experience of the viewer and results in a critique of the iconic image of a spectacular building. Architecture within architecture, or a building within a building, defines its topology. Architecture is thus a piece of art contained within a spatial topology. The museum is a city within a city, or an environment that contains multiple environments. The idea of containment is critiqued each time there is spatial delimitation. The spatial reading of inside/outside is broken as spaces flow between city and lobby, the lobby and galleries and intermediate poched spaces. This topological space develops several poched spaces or positive-negative inversions. A single surface-envelope enfolds multiple times.